Ghana's President John Kufuor says the discovery of the country's first major oil deposit could turn the West African country into an "African tiger". "Even without oil, we are doing so well... With oil as a shot in the arm, we're going to fly," he told the BBC. "My joy is that I'll go down in history as the president under whose watch oil was found to turn the economy of Ghana around for the better," he said. The discovery of 600m barrels of light oil offshore was announced on Monday. Reserves in the Mahogany exploration well were far greater than the 250m barrels that UK-based firm Tullow Oil had earlier forecast. Tullow, which saw its shares rise more than 12% on the news, jointly owns the West Cape block where the drilling took place with Anadarko Petroleum. Correspondents say champagne bottles were popping at Osu Castle, the seat of Ghana's government, after the announcement. 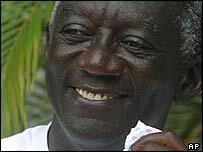 Mr Kufuor said the discovery would give a major boost to Ghana's economy. "Oil is money, and we need money to do the schools, the roads, the hospitals. If you find oil, you manage it well, can you complain about that?" he told the BBC's Focus on Africa programme. He dismissed suggestions that Ghana may follow in the footsteps of other countries that have mismanaged their oil wealth. "Some are doing it well and I assure you if others failed, Ghana will succeed because this is our destiny to set the good pace for where we are. So we're going to use it well," he said. "We're going to really zoom, accelerate, and if everything works, which I pray will happen positively, you come back in five years, and you'll see that Ghana truly is the African tiger, in economic terms for development." His sentiments were echoed in many of Ghana's newspaper headlines on Tuesday. The Statesman hailed the Gold Coast, Ghana's name under British rule, finding "black gold" and the Accra Daily Mail leads with the headline: "Thank God. Oil at last Thank God!" The BBC's Will Ross in Ghana says the country is the midst of an energy crisis and every four days everybody has their electricity switched off for more 24 hours. Ghana is described as somewhat of a success story in Africa but the country does suffer from widespread poverty and also has alarming levels of corruption, our correspondent says. Tullow chief executive Aidan Heavey said the discovery was one of the biggest oil discoveries in Africa in recent times, but warned it could be up to seven years before the oil started to flow. Tullow Oil holds a 22.9% stake in the West Cape Three Points licence and just under 50% in the Deepwater Tano licence. The move comes as foreign firms are increasingly tapping into Africa for oil. Do you think Ghanaians will see the benefits of the oil revenue? How should the money be spent? I am very happy for Ghana. To be frank Ghana is the most successful country in Africa with the little resources they have. Now that there is oil, just as President John K said, Ghana will become African tiger. I am optimistic that in the next five to 10 years, Ghana will become African heaven. I am praying that Nigerian President Mr Yar'Adua should copy Ghana in line of administration. GOD BLESS GHANA. I work for Chevron and I am Ghanaian. I have seen oil mismanaged in Nigeria, Equatorial Guinea and Angola. Why should Ghana be any different? After all look how we have managed our other natural resources like gold and diamonds... the reality is that all or most of the revenue will be lost through corruption, mismanagement. Thank God for oil - I don't think so. I would trade this for zero corruption, less brain drain, better management any day. As the saying goes, if you want to know how your wife will look like in her 40s and 50s, look at your mother-in-law. Oil in Africa normally comes with conflict and corruption. I would rather be happy than having oil which will cause division among tribes in our only country. God bless Ghana. For as long as the people holding shares in the exploratory and managing conglomerates are NOT Ghanaians, the little revenue that the government will get through royalties and taxes will never reach an ordinary Ghanaian. Almost all the proceeds are externalised by the share holders to their homelands and the government's revenue ends in the leaders' pockets. Who does NOT know an African leader? Look at my country. All we pray is to see the current generation of leaders pass, maybe God will bless us with progressive brains in the next generation of ours. Thank you. I am happy for Ghana and pray this discovery doesn't bring disunity in the country just as in the case of Nigeria. In Nigeria the money realized from this oil had not been used for the development of the country rather it had gone to the pocket of few, selfish individuals (leaders). Ghana is indeed a blessed nation. However their leaders should not make this discovery of black gold as a means to enrich themselves as most of our previous and some of our current African leaders are doing. God bless Ghana and its people. Let's hope Ghana does spend the oil money on roads and hospitals, not on palaces and armies as in most oil states. Even without oil in Ghana, we have been doing well. Oil in Ghana has the cheapest price in Africa compared to Nigeria, Angola, Algeria, etc where oil is produced. So for me, with proper management, we shall actually reach the middle income status by 2015 as the president is envisaging. There should be no envy of any sort from any party. It is a national feat.